Check on the nice people who placed the order. Clean up after the nice people leave. That’s the gist of what a server does, right? Oh, the misconceptions about the job of a server! Love the hustle and bustle of restaurant life but want to switch things up a bit? Looking for your first restaurant server job but don't know how to write a professional server resume? Waited on a few tables too many and want to work somewhere different? This guide will show you how to build excellent server resumes for the food service industry and how to talk about your work if you want to switch careers. Proving to a restaurant manager that you’re the next best thing to happen to his establishment doesn’t have to be difficult. 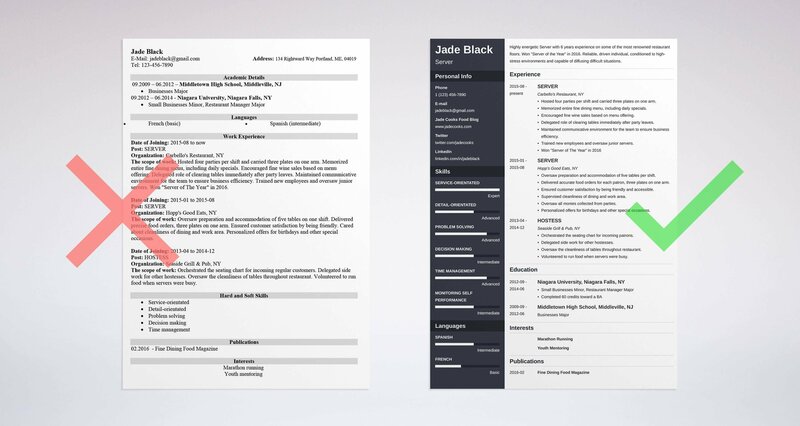 A server's resume example better than 9 out of 10 other resumes. How to write a server resume that will land you more interviews. Tips and examples of how to put skills and achievements on a resume for server jobs. How to describe your experience on a resume for a server to get any job you want. You need to know how to write a resume with server experience the right way, so put down that appetizer plate. We’ve got work to do. Here's a sample resume for a server made using our resume builder. Server Resume Examples - See more templates and create your resume here. What's the Best Format for a Server Resume? There are over 600,000 restaurants in the U.S. that receive server resume samples regularly. Offering a hastily put together waiter resume won’t help you but giving a recruiter one that reflects your experience and your skills and abilities, will. The reverse-chronological resume format is the way to go. As the most widely recognized format, it starts with your current employment history and then goes backwards. It will show your past employers, dates of employment, and your educational history. Let’s say you’re Penny from the Big Bang Theory. The Cheesecake Factory would be one of the first serving jobs listed on your server resume example because it is the last job you held. Wherever you worked before the Cheesecake Factory would go underneath it. 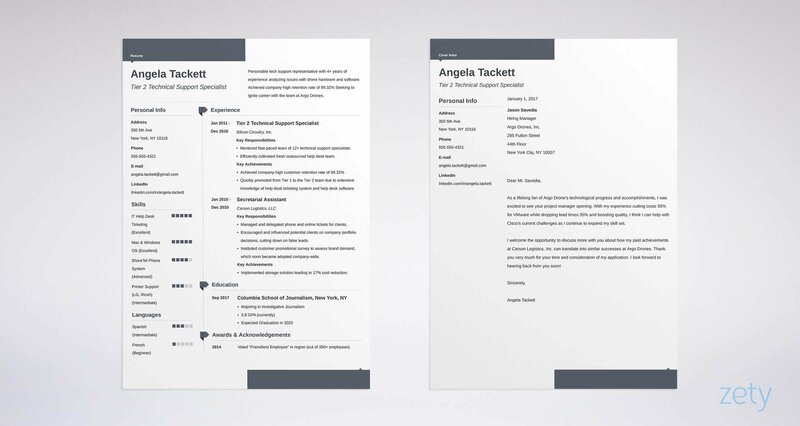 As you draft your server resume template, be sure to use a font that isn’t hard to read or bigger than your appetizer plate. Use fonts like Arial, Helvetica, Calibri, and Verdana, with a font size of 10 - 12 points. Keep it short, sweet, and to the point. It should be no more than a page long. If you notice it getting beefy, cut out any extra bullet points. Pro Tip: Read your resume out loud to yourself to catch any spelling or grammar mistakes. Have a friend or family member check it over, too. Recruiters like to see words spelled right. Your server resume should reflect your professional demeanor. Make your waitress resume unique. Recruiters say they reject 54% of resumes that aren’t customized or tailored. Do you have additional skills for your resume? Cocktail server experience, perhaps? See our post: 3 Resume Formats: How to Choose the Best Ones [Examples] to see which would be more suitable. Back in the day, the contact information section of a basic resume consisted of your name, your address, the name of your first born child, and your secret service identity number. These three elements should be presented professionally and clearly. Other server resume examples fail to make this point. We don’t like to fail and neither do you. Avoid offering additional calling information in this section. Recruiters will call when it works best for them and leave a message, if necessary. Pro Tip: Use a professional email address that includes your name. Skip the Hotmail and Yahoo extensions and go for a Gmail domain, instead. For more on how to add the basics to your fast food resume, take a peek at our guide: “How To Build A Resume: A Step-By-Step Guide (+30 Examples)” or this fast food resume guide. You know what professional format you are going to use for your waiter resume and you know how to add your contact info. Now you just need to blow them away with the reason you’re so good at food server duties and responsibilities. Oh, and balancing a cake on your nose. If you’re a fine dining server or an experienced server looking to create a head server resume, use a resume summary. A server resume summary highlights your experience and skills. Three-plates-on-one-arm fine dining server with 6 years experience on some of the most renowned restaurant floors. Looking to work with other team-oriented servers to maximize the restaurant experience. Fine dining server with six years experience waiting tables and serving large parties. If you’re new to the world of serving, you want to know how to be a server using a resume with no experience. Start by using a resume objective. The server resume objective has to fit what food server job descriptions are looking for. Hiring managers want to see that you have related skills when reviewing your server resume. Reliable, driven individual conditioned to high-stress environments and capable of diffusing difficult situations. Seeking to use those talents on the floor of restaurant X.
Untrained server looking for difficult situations to serve tea and crumpets. Reference skills you learned in school or at other jobs that are relevant to the job of a server to let hiring managers know what you’re capable of. Pro Tip: A server resume summary is a great place to put your hours of availability. Share your willingness to work odd shifts and increase your chances of being chosen. Restaurant hours are not 9 to 5. For managers, evening and weekend hours are the hardest to fill. Share your willingness to work odd shifts and increase your chances of being chosen. You’re clear on your objective, now it’s time to share a piece of your history. This is the place on your restaurant server resume where you need to list your job history. You want to write no less than six responsibilities or achievements under each server resume description. Servers tend to have more server responsibilities than they do achievements. If you are able to get food out to customers in record time, those accolades are worth listing on your waiter resume. Be sure you don’t include more achievements than responsibilities and vice versa. Try to list the same number of each. Use bullet points to list your responsibilities. Avoid using “responsible for” before each duty you list. It’s boring. You’re not boring. You’re a firecracker. You want your future employer to think you're a firecracker, too. 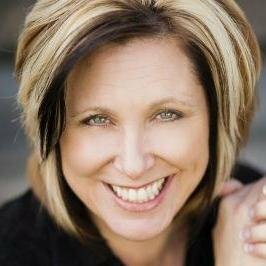 Consider this - hiring managers aren’t interested in reading the ever popular, overused words “responsible for” six or more times. Adding those words is just plain irresponsible, don’t you think? Hosted four parties during each shift. Executed clearing tables immediately after party leaves. Oversaw all monies collected from parties. Carried three plates on one arm. Personalized customer happy birthday songs. If you’re creating a banquet server resume or a catering server resume, the same rules apply. Pro Tip: Use powerful action words on your resume to describe your server duties and responsibilities for the hiring managers. Tired action words won’t excite them. We experience education in lots of different ways. Some of us finish high school, some of us don’t. Some of us head off to college, some of us don’t. Here’s the good news - you don’t need to have a high school diploma or college degree to be hired as a server. Having said that, hiring managers tend to show more interest in those who have an academic track record. It shows them you have a level of responsibility and discipline. If you’ve completed college, you won’t need to include your high school information on your server resume. List your college information, including the type of degree, your major, the name of the college or university, the location of the college or university, and any awards or honors you’ve earned. Start by listing your highest degree first. Perhaps you attended college but didn’t finish. Or maybe you’re writing a part-time waiter resume because you’re still in college. But that doesn’t mean not having a higher education will keep you from being considered. That’s good news if you struggle with what to put on a food service resume in this section. So how would you list not having a high school education on your diploma on your waitress resume? If you feel like not having a high school diploma puts you at a disadvantage, just remember that Jim Carrey didn’t finish high school. Nor did Bill Gates. And just look at what these icons have accomplished. Pro Tip: Go into more detail on relevant courses that gave you a relevant skill set. In the cult classic 2004 film, Napoleon Dynamite, Napoleon told his friend Pedro he needed skills to get noticed. Without skills, no one of the female persuasion would seriously consider going to the dance with him. The same is true in the foodservice industry. Without the right skills, no restaurant manager is going to seriously consider you. Or dance with you. Or both. In order to understand what kind of server skills to list in this resume section, first look at the restaurant server job description. This will help you understand what to put on a restaurant server resume for skills and abilities. Looking for high-energy servers who are fun and friendly and value our customers. Communication skills and taking pride in what you do is key. You have the right attitude and know how to work with a team. Most of all, you’re always on time and enjoy the work you do. Dynamic and energetic during all shifts. Conversational with customers and coworkers. Compatible with team members and management staff. So what are good server skills to put on a resume? Add any other relevant server skills to your server resume sample that are sought in the server job descriptions. Pro Tip: Adapt your resume skills to the server job description. Use powerful action words in your skills section so that you stand out among the rest. Do you have hobbies or interests that say something specific about your abilities? Did you write a book about plate spinning and juggling ramekins? Did you swim the English Channel and run a marathon? Add those that are relevant to your role as a server. Individual sports - You're fit and you enjoy challenges. Writing - You’re able to articulate thoughts with ease. Puzzles - You're an analytical thinker with problem-solving skills. Board games - You're an intelligent strategist. Social hobbies - You communicate well and connect with others. Pro Tip: Make your food server resume special by choosing hobbies that match the desired traits of the company. You’ve put together a professional food service resume. Now you need a cover letter. Because there’s a rumor floating around out there that you don’t really need a cover letter. But we know that 45% of recruiters will disregard even the best server resume without one. So we’re going to show you how to write one that shines. Recruiters don’t have time for boring, bland cover letters. They want something fresh. If you want the job, you’re going to have to deliver. Hiring managers will probably spend about 6 seconds looking at your server resume. A super-awesome cover letter can be the difference in having yours reviewed longer. Explain why you’re the perfect fit. You want to make your first paragraph compelling. Pro Tip: Let your personality come through. Be yourself. Witty, well-written cover letters make the process for hiring managers enjoyable. Choose the standard, respected reverse-chronological format for your server resume. Make sure you read the job description before tailoring your resume to match the position requirements. Put your best foot and qualities forward, and take the resume creation process one step at a time. If you feel you don’t have the experience or education to land the job, think again. You can always add hobbies or interests that will impress recruiters enough to give you an opportunity. Do you have any questions on how to make a server resume? Give us a shout in the comments section!